FLINT TWP. — For the past several years, firefighters from the Flint Township Firefighters Association has adopted several Flint families for the holiday and providing them with the makings for a Thanksgiving dinner. 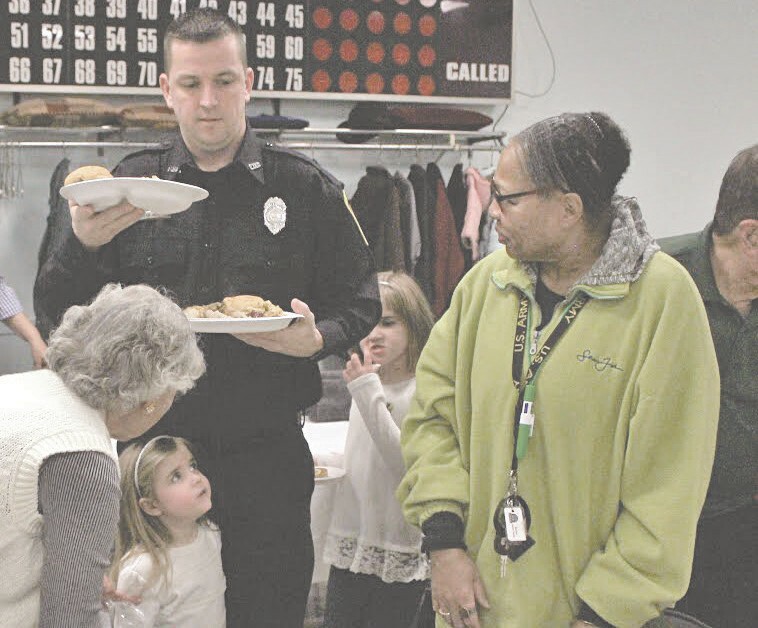 This year, they decided to shake it up a little bit and adopted dozens of families—all members of the local senior citizens center who lined tables in the hall and were treated to time with the firefighters and their families and a few special guests. Executive Director of the American Red Cross Amy Meister and Annette Swain Red Cross Disaster Program Manager attended as well as trustee Jim Rouse from the township board and officers from the township police department who were present to take back prescription drugs. 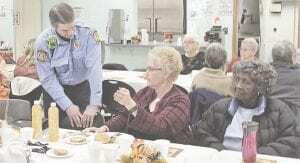 Senior Center Director Pam Luna said the senior were looking forward to the free meal. Resident Betty J. Jones, a Flint Township resident for 13 years said the dinner was ‘fantastic’ and she was thrilled the firefighters thought enough about somebody else to do this for them. Ryan Woods and his daughters, Allison 4 (at left) and Kendal 7, bring dinner to seniors at their table. 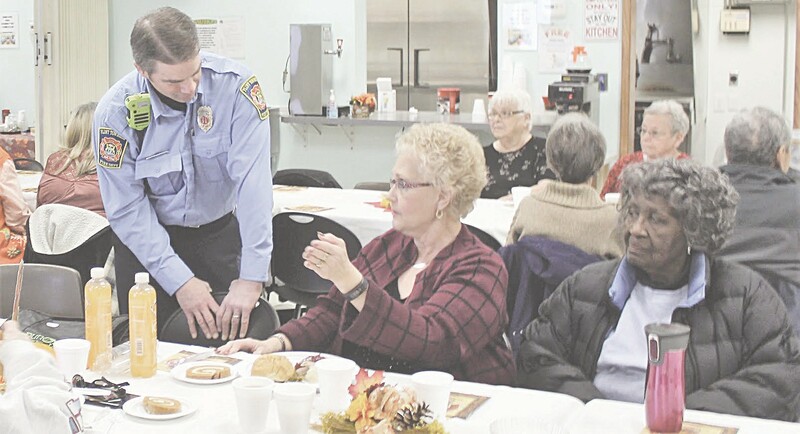 Ryan Woods, a firefighter, said the dinner was the brain child of Assistant Chief Mike Burkley who felt their money could help more people by serving dinner for the seniors and hoped the event was a success. Jim McClung, President of the Senior Board said he thought it was great for the fire department to step up and do something like this. “I’m thrilled with the turnout,” he said. “It’s all about the seniors. Senior Center staff cooked partly Wednesday and started the rest of the feast on Thursday and made several turkeys as well as all the trimmings—even down to the from scratch mashed potatoes. The seniors thoroughly enjoyed the inaugural dinner.